Black cats are supposed to be scary, but no one has told that to this little black cat named Friday. 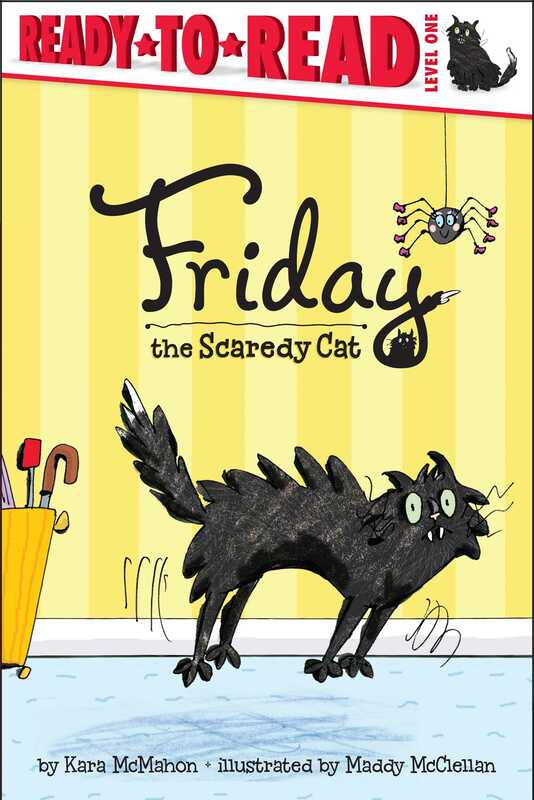 So, instead of being scary, Friday the Scaredy Cat is scared! When the doorbell rings, he jumps, runs, and hides. When a car horn beeps, he jumps, runs, and hides! But when something appears that should make him jump out of his skin, what does Friday do? Find out in this fun, sweetly spooky easy-to-ready level 1 story! Kara McMahon is the author of dozens of books for children. She lives in New York City with her husband, Bryan, and their cats, Friday and Cindy Lou Who, both of which were adopted from shelters. Supporting animal shelters is a cause she holds close to her heart, and she hopes that after reading about Friday, more people will make shelters their first stop when looking for a pet. Maddy McClellan works as an illustrator, printmaker, and painter. Among the many picture books she has illustrated are The Princess and the Pets; Kit the Cat, Dig the Dog and Other Stories; The Ratty Racers; and Song for a Princess. She lives with her husband and their two sons in South Downs, England.